And Mourinho has told his Manchester United players that they need to “grow up” if they are to stand any chance of overtaking their neighbours. In the aftermath of the shock Champions League exit to Sevilla, United manager Mourinho launched into an emotional 12-minute rant in defence of his 22-month managerial reign. He claims Pep Guardiola inherited a far better City squad than he did at United and says the £286m he has spent so far was necessary just to try and keep pace with them. Since their last Champions League final appearance in 2011, United have spent £706m – around £200m less than City in the same period. 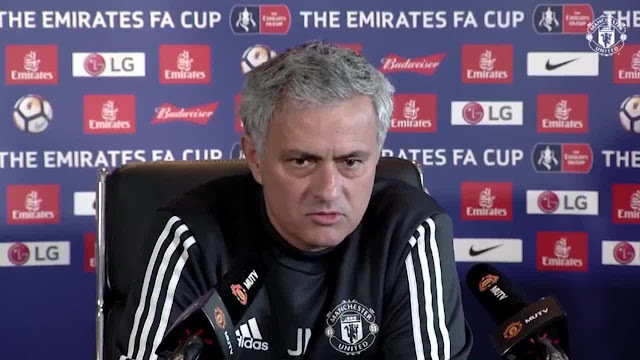 Ahead of the FA Cup quarter-final against Brighton, Mourinho has warned his stars they need to deal with the scrutiny they are under. He said: “The players have to learn how to cope with that level of expectation and that level of pressure. And Mourinho used his time-honoured diversionary tactics to explain away the shock Champions League exit to Sevilla. He swerved any admission that he got his team selection and approach wrong and failed to explain why his team played as if the handbrake had been applied. Instead, Mourinho went on the attack, laying the blame on his current players, his two predecessors David Moyes and Louis Van Gaal for their poor recruitment, and told the fans and critics to take a reality check. And he claimed arch-rival Pep Guardiola started off in a far stronger position at champions-elect Manchester City than he did when he arrived at Old Trafford in the same summer. In scenes reminiscent of Rafa Benitez’s infamous “facts” rant in 2009, Mourinho delivered an emotional 12-minute state of the nation speech aimed at defending himself against the growing army of fans and former players who are questioning whether he is the right man to take United forward. But in doing so he unintentionally damned his own transfer policy by naming only Romelu Lukaku and Nemanja Matic of the eight players he has bought in a £286m spending spree as examples of the better quality players he will leave his successor. Pointedly, he failed to mention the club’s £89m record buy Paul Pogba, or new arrival Alexis Sanchez, United’s highest-paid player, both of whom have been huge disappointments so far. And in an attempt to big up United’s conquerors Sevilla – widely regarded as one of the weakest teams in the Champions League’s last 16 – he claimed he would love to have “many” of their players in his side. He talked repeatedly of “football heritage”, pointing out that United had reached one Champions League quarter-final under four different managers since their last appearance in the final, and finished in the Premier League’s top four only once in four seasons. He claimed he was still in a rebuilding process and will leave his successor a far better squad than he inherited from Van Gaal. In pointing to the quality of players Guardiola inherited from his predecessor Manuel Pellegrini, he failed to acknowledge the improvements they have made under the former Barcelona coach. Despite admitting it is going to be a huge challenge to stop City’s dominance, Mourinho dismissed suggestions he is ready to jump ship for an easier life with Qatar-backed Paris St Germain. He insists he retains the backing of United’s American owners, the Glazer family, and executive vice-chairman Ed Woodward and will not change the methods that have made him one of football’s most successful if controversial managers. "I could be in another country with the league in my pocket before the season even starts, but I am here and I am going to be here and no way am I going to change my mentality. I am not going to run away because of a few boos. He must feel he is running into a brick wall – with Manchester City’s name splashed all over it.